Your Pleasanton Realtor Real Estate Review - Planning to Buy or Sell a Pleasanton Home? 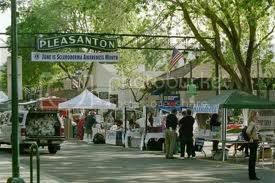 Take a moment to review this Pleasanton city information. Don't hesitate to call with questions. Buying or Selling a Home in Pleasanton ? We hope this Pleasanton city information will be valuable to you. In spite of massive growth in many sectors over recent years, the city has managed to preserve the small-town charm mirrored in the gateway "Pleasanton" arch and the historic Pleasanton Hotel and Cheese Factory buildings. Traditional shops and long-established services harmonize with modern development like the Hacienda Business Park developed by the Prudential Company and the Callahan Property Company. Known as the Jewel of Amador Valley," Pleasanton offers lush rolling hills, a warm community spirit, attractive housing options, and convenient rapid-transit connections to major Bay Area employment centers. Thanks to an active parent parent community and strong local government support Pleasanton's schools have long been recognized as schools of superior academic acheivement win such awards as California Distinguished School for Recognition of Excellence. View more Pleasanton Real Estate? Agent's affiliated with The Gregori Group are among Pleasanton's top agents and are experts regarding Pleasanton Real Estate. They are members of the Bay East Board of Pleasanton Realtors, as well as the California and National Associations of Realtors. As California Licensed Real Estate Agents practicing in Pleasanton, they will provide you with responsive, enthusiastic service whether you are interested in buying or selling your home (house) in Pleasanton or other East Bay Cities. The Gregori's are broker/owner's of The Gregori Group a team Pleasanton Realtors representing Pleasanton clients in the processes of buying or selling Pleasanton real estate. With a 25-year background in real estate investment and sales, The Gregori Group has the knowledge and expertise to help you make critical decisions about one of the largest investments of your life .